The Diode laser features one of the fastest hair removal and rejuvenation treatments in the world. The Magma Diode Laser allows each treatment to be specifically tailored to each patient at every stage of the treatment process. The Magma platform offers effective and painless treatment to clients of all skin types including darker skin. The Dermapen glides over the skin and microscopic channels are lightly stamped into the skin, stimulating a wound-healing response with intense renewal repair and rejuvenation. 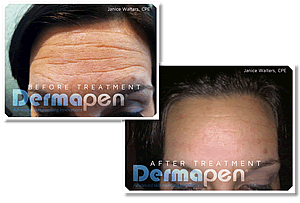 Dermapen promotes scar-less healing and natural collagen reproduction, without side effects and downtime. 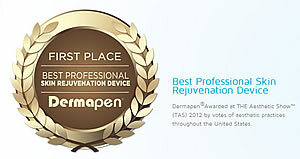 Dermapen provides effective management for most skin conditions and is suitable for head, face and body applications. Dermapen can treat hard-to-reach places (e.g. around the eyes, nose and lips). 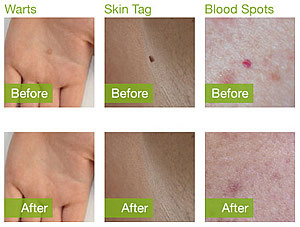 Dermapen: Skin Rejuvenation (see image right): Before and after treatments. How Many Treatments? The typical treatment plan will consist of 5-6 treatments. The Dermapen Cryo delivers quick, effective Cryotherapy treatments to benign skin lesions. Cryotherapy (cold surgery) is a highly effective and safe procedure that is used to freeze and destroy using liquefied nitrous oxide. How many treatments? The typical treatment plan will consist of 1-3 treatments. Radio frequency (RF) produces a localised heat in the areas where it is applied. This in turn stimulates dermal fibroblast, which responds by increasing collagen. This results in improvement of the skin's appearance and slows the ageing process. How many treatments? The typical treatment plan will consist of 4 -6 treatments. How long do the treatments take? Most facial injection treatments take between 20-30 minutes and the effects start to appear within 2-5 days. The maximum effect is reached after 2 weeks. How long will the effects last? The effects of anti ageing injections can last between 3-6 months, dermal fillers last 8-12 months. The effects of these treatments wear off gradually and may be repeated as necessary. 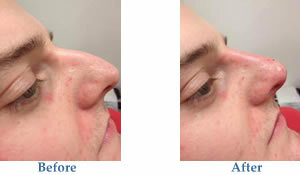 Non-surgical, or medical rhinoplasty is a technique for remodeling the nasal framework. Dermal filler can be used to smooth out minor bumps or depressions on the bridge of the nose. Fillers can also be used to lift a droopy nose tip. Silhouette Soft is a unique treatment, combining two actions: Lifting & Regenerating. The lifting effect is immediate. The regenerative effect is gradual and natural. Overtime, Silhouette Soft stimulates generation of your lost collagen to redefine your features while maintaining volume. Its component, Poly-lactic acid (PLA), is entirely re-absorbable and has been used for many years in various medical fields such as cardiology. 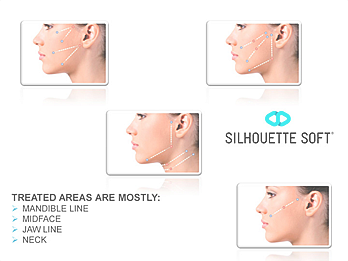 Silhouette is a unique treatment which can be carried out on different areas of the face and neck with long lasting results. The process is done under local anesthetic, and the Silhouette Soft suture inserts under the skin using a fine needle. There is no incision, and the downtime is minimal. 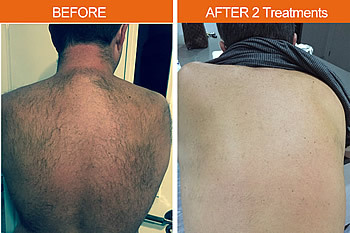 BIPTRON has a positive & long lasting effect not only on the treated area but also on the whole body. Also known as Semi-Permanent Cosmetics, Derma Graphics or Cosmetic Tattooing. This cutting edge Aesthetic treatment for both men and women employs the latest techniques to achieve lasting colour or definition. We use the latest technology for laser tattoo removal and it is considered to be the most effective, safe and reliable way to remove unwanted multi-coloured tattoos with consistent predictable results. Specialised cell-regenerating ingredients restoring skin structure. It is recommended for the treatment of premature ageing, photo-ageing and acne marks. Efficient, rapid and reliable acne treatment. It inhibits the action of acne-causing bacteria which contributes to the elimination of inflammations and irritations. The absolute anti-ageing and firming therapy with red and black caviar. Caviar is rich in proteins, vitamins, amino-acids and trace elements. It provides kin the essential ingredients needed to preserve the integrity of its cells. A hydrating treatment based on Hyaluronic acid. It offers deep and long lasting skin hydration, aids in the production of new cells and inhibits the action of free radicals. Institute treatment for combating skin irritations. It is recommended for skin cleansing, sensitive skin and telangiectasais and also for the treatment of seborrheic dermatitis. Potent lifting – alternative institute treatment which is based on proteins. It invigorates the skin and restores its firmness. Intense revitalisation, exfoliation, hydration, firming and regeneration. The combination of AHAs and multi-action active ingredients gives this treatment a broad and highly effective result. Anti-ageing and firming eye therapy using specialised eye serum. Combating edemas, dark circles, and fine wrinkles around the sensitive area of the eyes. Please see our facial aesthetics fees (pdf file). Book your treatments now - Call us on 01323 487231 or after hours on 0754 561 1932. We are open Monday to Friday between 8.30am and 17.30 pm. Evening and weekend appointments are available by arrangement. Please contact us for more information.